Anyone who goes to the cinema in London around the middle of October may notice an increase in daytime showings of strange films, attended by even stranger people waiting in the lobbies while loudly sharpening their critical knives with terms like “execrable cinematography” and “non-versimilitudinous mise-en-scène”. While I’ve never been too sure whether he who is tired of London is really tired of life, anyone tired of the annual London Film Festival must certainly be tired of cinema. The festival which began on 9th of October and ends on 20th of October is showcasing 234 features and over 100 short films from across the globe. Each film festival has its own character, and the BFI London Film Festival is a prestige affair. It is not exactly agenda-setting in the way that Cannes is for international commercial distribution, Sundance for indie cinema, or Berlin for new discoveries. Instead it draws together a generally mainstream range of internationally renowned directorial talent, combining commercial appeal with a sense of solid artistic achievement. Both the opening and closing of this year’s festival sees Tom Hanks on the red carpet. He puts in an admittedly stunning performance as Captain Phillips, a middle-aged family man turned hero, in the true story of the container ship boarded by Somali pirates in April 2009. Although rendered with earnest realism by Paul Greengrass’s (United 93, The Bourne Supremacy) direction, the film is basically a Western on the waves, as pirates terrorise the isolated Americans until the Navy Seals sail to the rescue. Hanks, in an Italian Interview, claimed to be on the side of the Somalis, who in real life have seen their fishing stocks devastated by the somewhat greater piracy of international trading interests. But Captain Phillips is concerned with serving up a tensely exciting – and it is a great watch – action adventure story which makes sure you know who the bad guys are (clue: they’re not the Navy Seals). Hanks will also appear as Walt Disney in the festival’s closing film, Saving Mr. Banks, an account of the producer’s encounter with PL Travers (the writer of Mary Poppins). The main British features include Philomena (not available for screening at time of writing). In this film, Steve Coogan plays the role of a cynical journalist, Martin Sixsmith, who is in pursuit of a human interest story, namely, that of Philomena (Judi Dench), an Irish Catholic on the trail of the illegitimate son she was forced to give up for adoption many years earlier. Starred Up on the other hand is a tough prison drama which provides many of the main traits of the genre: pitiless inmates jockeying for position, the conflict between an uncaring system, an evil chief warden and the idealistic counsellor who seeks reform, and extremely brutal violence. This seems to cover two diverse strands in British film production – upscale political investigation and gritty realism – but they show that British cinema still concentrates principally on acting and character, and an issue-led approach to drama. Unabashed entertainment comes in the form of Gravity. 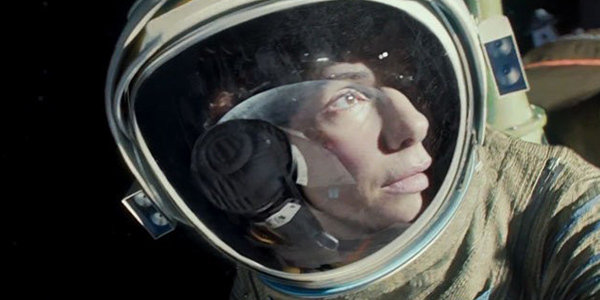 In this two-hander between Sandra Bullock and George Clooney, astronauts are stricken high above the earth’s atmosphere after a shower of debris knocks out their space vehicle and kills the remaining crew. The film employs one of the best uses of 3D technology I have seen so far, and I was (somewhat embarrassingly, on reflection) ducking behind my seat as the film lived up to its characters’ promise to be “one hell of a ride”. The shots of the earth and sun are beautiful, and extra weight is given to the roller-coaster experience by its underlying theme of humanity’s fundamental solitude and urge to live. Some films to look out for in your cinema in the coming months will include the Cohen Brothers’ musical drama Inside Llewyn Davis, and Enough Said, the romantic comedy distinguished by being the last performance of the late James Gandolfini. Meanwhile, Steve McQueen (Hunger, Shame) returns to direct 12 Years a Slave, a plantation-era costume drama. The festival also showed Palme d’Or winner Blue is the Warmest Colour, a three-hour long French film that shocked and enthralled audiences at Cannes for its scenes of lesbianism. Jafar Panahi, jailed for six years by his home country Iran in 2010 for “propagandising against the nation”, manages to break the embargo with the release of Closed Curtain, while Hany Abu-Assad, director of Paradise Now, returns to questions of violence and love amidst the occupation of Palestine in Omar.